The Starbucks Coffee Company is the leading global provider, roaster and marketer of coffee specialties, with over 13,500 branches and stores in North America, Latin America, Europe, the Middle East, as well as the Asia-Pacific region. Starbucks – surely everyone knows the very memorable logo of the successful company, which could actually be regarded the founder of a completely new industry sector. 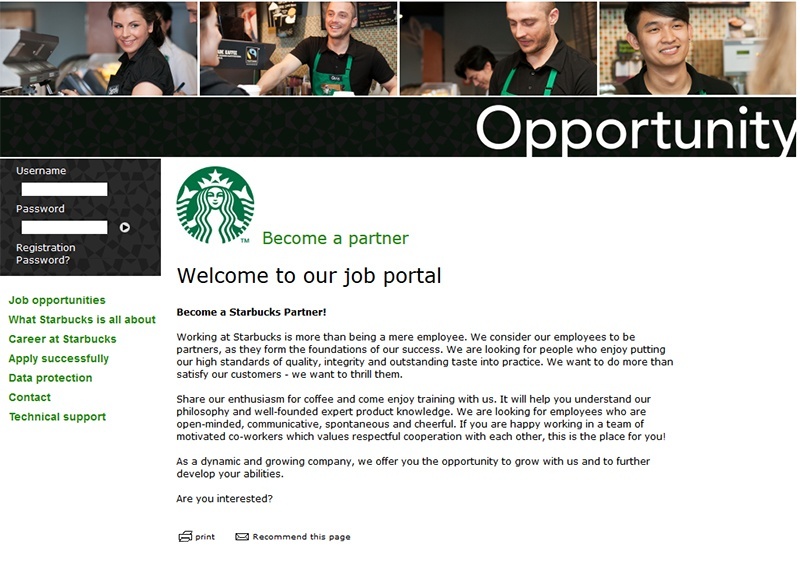 Starbucks Switzerland and Starbucks Austria were looking for a flexible and easy-to-use recruitment software in order to meet the demands of a decentralised recruitment process. At the same time, the high-quality and real-time support of all applicants was to be ensured. With the new e-recruiting, local store managers now work completely autonomously in the recruitment process. Within the framework of centrally managed templates, they create their own job advertisements and select suitable potential candidates according to corporate criteria. The software, in order to support the store managers in the recruitment process as far as possible and to comply with central regulations at the same time, automatically generates a multitude of data for the work contract according to location, pay scale and job profile. The rexx workflow engine supervises and controls all processes, provides warning messages and thus contributes to the optimal support of applicants as well as a positive and unified external appearance of the company. The web-based technology of the recruitment software enables a simple roll-out across all branches. The branches need nothing more than a web browser – and off they go. The software supports all languages that are needed, amongst others German, French, English, Spanish or Italian. Introduction of flexible and user-friendly recruitment software with the goal of decentralising the recruitment process for Starbucks Switzerland and Austria.